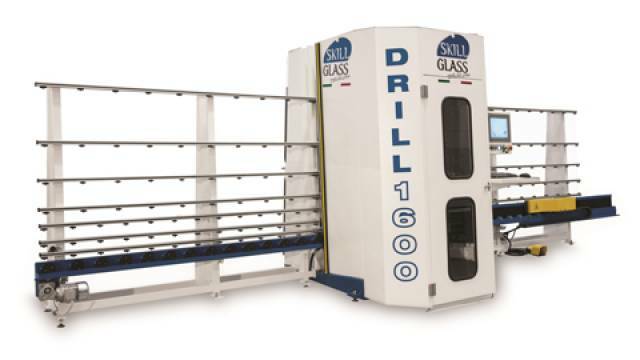 Skill Glass is an Italian company specialized in the manufacture and design of high technology numerical control machines for the processing of flat sheet glass, which combined with special software with dedicated functions and modern and functional design, are simple and quick to use. DRILL 1600FF is a 5-axis CNC drilling machine designed for producing holes, inserts and countersinks on rectangular flat sheet glass with a thickness of 3 to 20 millimetres. The machine is composed of five axes, X, Y, V, Z and W, and two electro-spindles, which as opposite drilling heads create a double-sided drilling system that makes perfect holes. This vertical drilling CNC is able to operate with extreme speed and precision thanks to the management of all the processes by numerical control and also thanks to the support of the double tool change. The milling on this machine is a simple and quick operation and by using multiple tools can mill and grind an insert in just a few seconds like the polishing that can be carried out in small inserts with 50 or 30 millimetre grinders. E-D 101 is a vertical CNC centre for grinding, milling, drilling and polishing flat sheet glass. The machine combines all the technology for vertical drilling and milling with the features of a vertical grinding machine. Its main benefit is its versatility, which allows for different types of processes at high speeds and optimal precision. E-D 101 works with 150 millimetre diamond-tipped grinders on sheet glass even if they have been laminated or low-E. Polishing can be performed on large surfaces with 150 millimetre grinders as well as on small inserts with diameters of 30 or 50 millimetres. Oppositely placed heads ensure drilling is at maximum speed with top quality and precision, and countersinking can be performed with individual diamond tipped tools or with accessories mounted on the drill bits. The power and precision of the machine guarantee rapid and simple milling and multiple tools produce milled and grinded inserts in a few seconds.